According to tradition, the remains of Saint Lucy were taken from Constantinople in 1204 by the Venetian doge Enrico Dandolo, along with those of Sant’Agata during the Fourth Crusade. According to another testimony – the Cronaca Veniera, in the Marciana Library of Venice – the body was brought to the lagoon in 1026. But this was probably due to an error of the amanuensis, who transcribed the year incorrectly. In the city there was already a church dedicated to the Saint, built in the second half of the twelfth century. 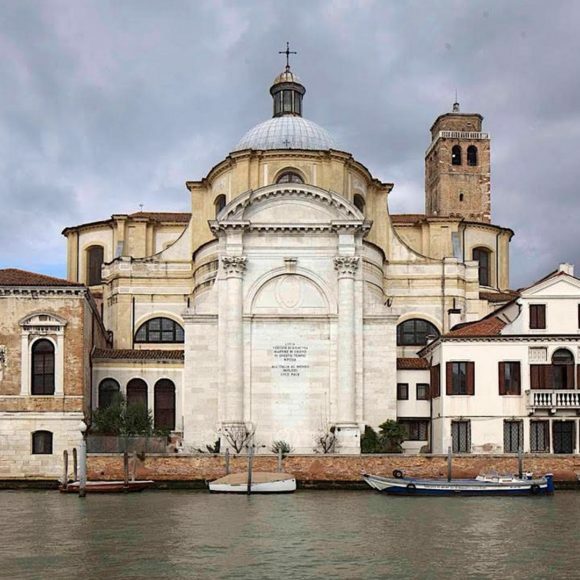 It is plausible that the decision to move the body of Saint Lucy to the lagoon was simply for the need to enrich a Venetian church, as had happened many times before. Lucy’s remains were first laid to rest in the church of San Giorgio Maggiore. After a tragic accident on Saint Lucy’s day in 1279, where pilgrims were drowned partly because of the numbers visiting Lucy, the Senate decided that the relics should be transferred to a city church, to allow better access. So, on 18 January 1280, led by a solemn procession, the body was brought to the church of Santa Maria Annunziata (or the «Nunciata») in the sestiere of Cannaregio. 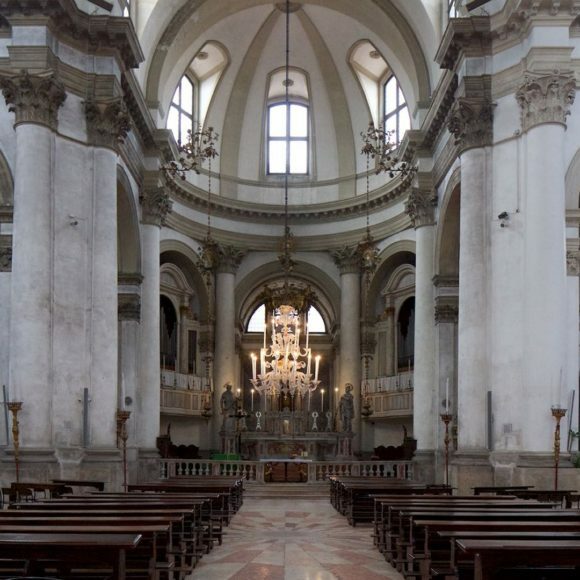 A new church, dedicated to Santa Lucia, was built in Venice and consecrated in 1313. In 1441 the sacred building passed on to the jurisdiction of the nearby convent of Corpus Domini and in 1574 to the Augustinian Servants of Mary. Over the years the building underwent various interventions and renovations. In 1580 Palladio made some drawings for interiors of the church. An inscription on the major portal has him as the author, although the building was only completed thirty years after his death. The chapel of Lucy is generally believed to have been based on his designs. After the Napoleonic decree of 1805, which called for the suppression of all convents and monasteries in Venice, the convent at Santa Lucia was closed. The original Santa Lucia church and convent were demolished between 1861-63 to make way for the new railway station. 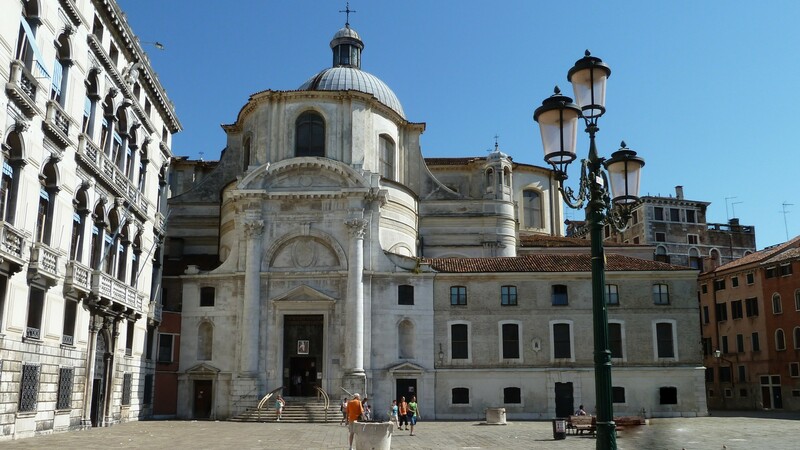 It was decided that Lucy’s relics should rest in the nearby church of San Geremia, where they still lie today. In memory of the old Santa Lucia church, the railway station took the name of Venice Santa Lucia. The church standing today was the last church built during the Venetian Republic. 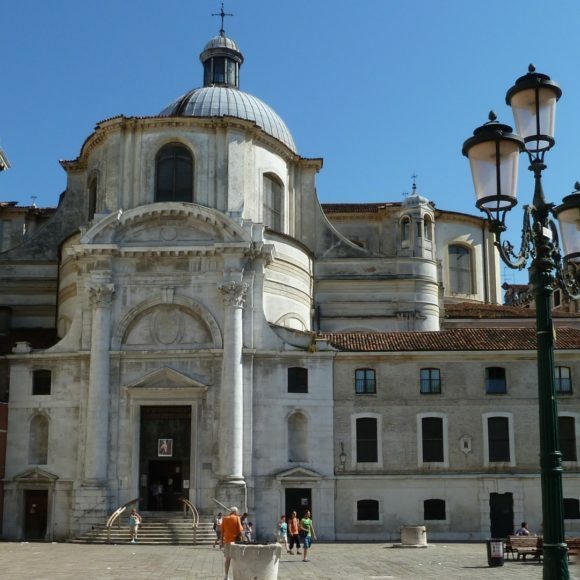 According to tradition, the first church of San Geremia was founded in 1013. This was then rebuilt, by the doge Sebastiano Ziani, in 1174. In 1206 it housed the remains of Saint Magno, bishop of Oderzo and Eraclea, who died in the seventh century. The church was consecrated in 1292. 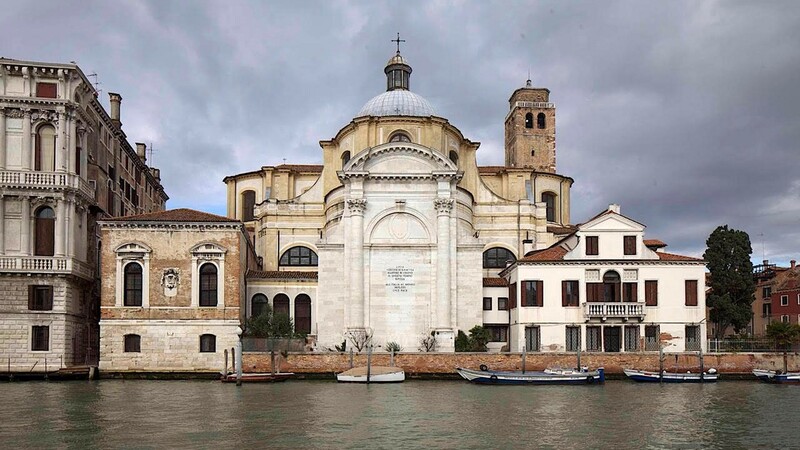 The old basilica building, with three naves, stood parallel to the Grand Canal. The presbytery was rebuilt in the sixteenth century. The campanile (bell tower) with its tower of plain brick with two narrow double Romantic windows at the base is one of the oldest in the city – thought to date from the 12th century. The belfry was added later. The church was built by Carlo Corbellini between 1753-60, who took his inspiration for it from the Salute church. Corbellini rotated the longitudinal axis of the building so that the main facade faced onto Campo San Geremia, with an entrance preceded by a high staircase. In 1870 the façade facing the Canale di Cannaregio was built. 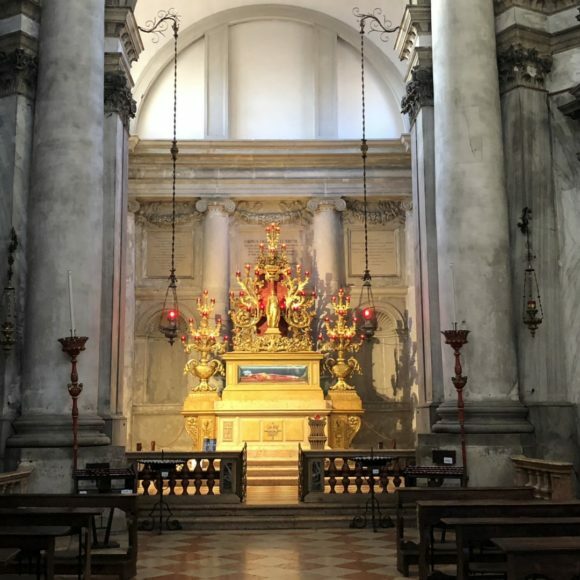 The church is a large building, built on the Greek cross model, with four wings and facades facing onto the Canale di Cannaregio, the Grand Canal and Campo San Geremia (the main entrance). The architect Corbellini considered the Cannaregio canal facade to be the most important. The luminosity of the church is created by twenty large windows placed high above. The church has a number of high Corinthian columns which give a sense of space and large windows which provide its luminosity. The interior is covered by a large oval-shaped dome, ended by a semicircular apse and is surrounded by four hemispherical domes. Bundles of Corinthian columns hold up the dome at the crossroads of the transept, supporting the arches of the minor chapels; in the intercolumns there are interesting eighteenth-century altars. The church features four paintings by Palma il Giovane (including the painting of Santa Lucia), and paintings by Tintoretto, Marchiorri and Schiavoni amongst others. 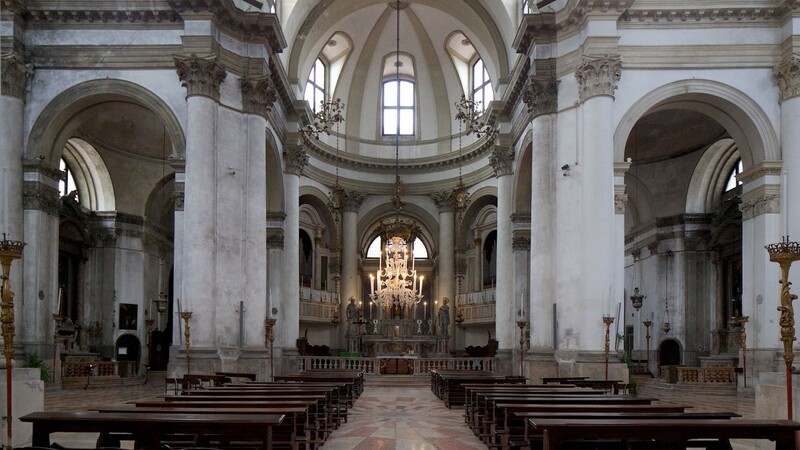 On 11 July 1860 Lucy’s relics were brought from the old demolished Santa Lucia church to the nearby church of San Geremia, where they remain today. 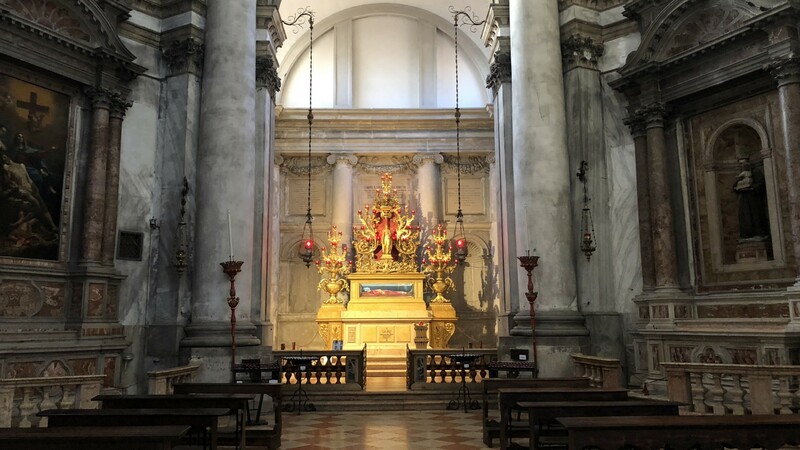 With the relocation of her relics it was decided that the church (dedicated to Saint Jerome since the 11th century) should now be called ‘Santi Geremia e Lucia’ (Saint Jerome and Saint Lucy). A new resting place for Saint Lucy was created on the wing of the transept of San Geremia (which faced towards the Grand Canal). The new chapel for her was built using marble from the demolished church and followed the original design by Palladio. The altar, in brocatello marble from Verona, was made with friezes of gilded bronze designed by the architect Gaetano Rossi. The seventeenth-century urn and altar were replaced in 1930 with the current one by the Venetian architect Gaetano Rossi, which allowed the body of Saint Lucy to be visible on both sides. In 1955, the future Pope John XXIII – at the time patriarch cardinal Angelo Roncalli – visited the relics of Santa Lucia. After his visit he commissioned the sculptor Minotto to make the silver mask that now covers the saint’s face. The prospect of the church on the Grand Canal corresponds to the chapel of Santa Lucia and on the exterior of the church stands the inscription (which can only be viewed canal-side): “LUCIA, VERGINE DI SIRACUSA MARTIRE DI CRISTO IN QUESTO TEMPIO RIPOSA ALL’ITALIA AL MONDO IMPLORI LUCE E PACE” (“Lucia, Virgin of Siracusa in this temple rests. To inspire light and peace in Italy and the world”).